Register Log In Vannin' Community and Forums Forums Wheels and Tires More than often selected new tires today ??? 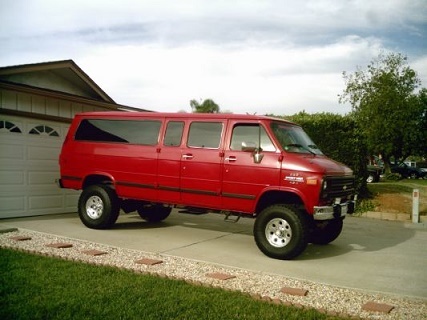 I'd like some opinions on the best new tires to purchase for my 1984 Ford E150 project. I believe most people use BFG 275- 60-15's for the backs and 235 or 245-60-15's for the front. Are these the most popular tires these days? Last edited by dreamweaver77; April 05th 2019 11:18 pm. General Grabber light truck tires. 235-75-15 all the way around. That is what I run on my 89 E-150. General Grabber 245/75/16 load range E truck tire on the 1990 G30 454 EXT. Way stiff, good in the wind. 30 inches tall, not fat. GM Factory alloys. These work well for a one ton, I run them on the '94 B350 Xplorer too, same size, factory wheels. Goodyear Wrangler 235/75/15.radials on the '88 B250, on Cragar black steel 5 spokes. Good all around relatively inexpensive tires that I don't mind too much if they pick up a nail in the alley. Thanks guys !!! These will go on my Ford 1984 E-150 Econoline. Will 60's be too short for the van? I've always used them in the past. Right now there are Goodyear 235-75-15's all the way around on stock steel wheels. I'm trying to go with the retro look. Most of my other vans had the BFG 60's all the way around.